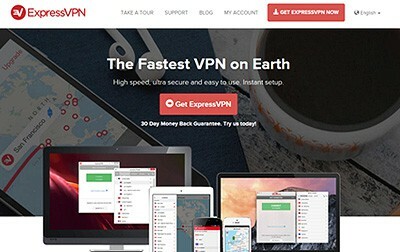 ExpressVPN Review - Your New Favorite VPN? ExpressVPN is a virtual private network that has really focused their attention to the modern wants and needs of users. On top of the obvious security measures necessary to create a strong network, they emphasize the desire to become the fastest VPN on the market. When first glancing at their website or mobile app, the overall aesthetics of their design would lead you to believe that they are one of the leaders in features and benefits for the VPN industry. While this is not entirely false, ExpressVPN emphasizes being really good at basic virtual private network features instead of attempting to make waves with new ideas. No matter how much experience or knowledge you have about virtual private networks, ExpressVPN makes it super simple for you to get started using their services. They provide in-depth setup tutorials through their support center and have a variety of customer support options if you are looking for individual assistance. The fact that ExpressVPN has over 1,000 servers throughout the globe allows them to offer top level speed to users everywhere around the world. No matter what country or continent you are on, there are several servers to choose from that allow you to enjoy super fast download times and seamless streaming. ExpressVPN works comfortably on Windows, Mac, Android, and iPhone devices. Their mobile software is very easy-to-use and reliable, which is refreshing considering how much some virtual private networks struggle to create strong services for mobile users. Obviously security is one of the major concerns when it comes to choosing a virtual private network. ExpressVPN certainly does not lack in this area. They have over 1,000 servers across the globe, meaning there are plenty of options for bouncing IP addresses around. As is traditional for a VPN, they encrypt all data that is transferred during web use and allow you to configure a lot of areas of the security to meet your unique needs. The customer support that ExpressVPN offers is among the very best that you will find in the virtual private network industry. These guys go out of their way to ensure that the needs of their customers are met in every way possible. They provide assistance through email, live chat, phone, and have a ticket system as well. They even have tutorials and troubleshooting guides to provide some self-help options to users. While it is difficult to pick a con associated with their services, one of the main disadvantages of ExpressVPN is that their month-to-month payment plan is a bit expensive. Their six month and annual plans, however, are very competitively priced when compared to the rest of the industry. It should also be noted that ExpressVPN has had some issues with reliability in the past. There was a short period of time where their VPN would constantly shut down, which provided a great deal of inconvenience to users and opened them up for some pretty serious security concerns. Currently, however, they are extremely reliable after taking great measures to ensure that those issues do not happen again. ExpressVPN offers three different options when it comes to plans for their users to choose from. While all plans have the same features (mobile apps, 24/7 support, and unlimited bandwidth), they do vary in pricing depending on the subscription commitment. Users that want to go with the month-to-month plan will be charged $12.95/month. If you commit for a six month period, you will be charged a semi-annual fee of $59.95. The annual option, which is ExpressVPN’s most popular plan, will set you back $99.50/year. Obviously the annual option is by far the best value of the three. At the end of the day, ExpressVPN is a great option for users that are looking for speed and customer support with their virtual private network. The high level security measures that they have in place are plenty strong enough to ensure a private web experience and their state-of-the-art hardware make browsing and streaming a breeze. While the prices are a bit higher than the industry average, you will be hard pressed to find another virtual private network that satisfies the modern needs of internet users better than ExpressVPN does. With their 30-day money back guarantee, there really is no risk in giving them a try.